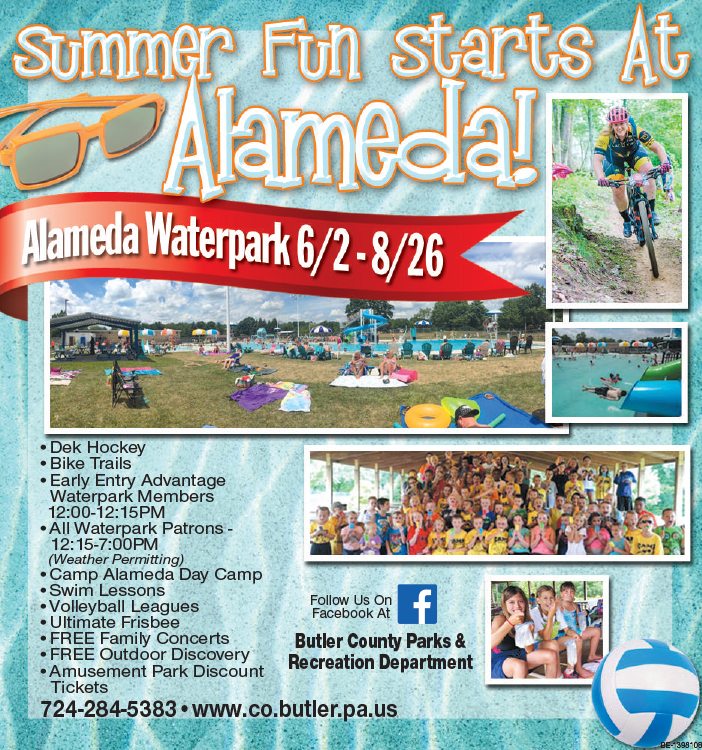 Alameda Park - Attractions | Visit Butler County Pennsylvania! The Butler County Parks and Recreation department operates year-round, bringing the residents of Butler County quality, affordable recreational opportunities. Alameda Park offers playgrounds, picnic areas, numerous shelter facilities, a newly created mountain bike trail, a community waterpark and is handicap accessible. Alameda Waterpark is waiting for you and your family with a Pirate's Cove Splash Pad as well as 2 enclosed tube slides, 2 toddler zero entries, new picnic tables, umbrellas and a sitting concrete wall lining the entrance of the pool. The diving well now features a new Aqua Rock wall, 2 diving boards, and a new drop slide.